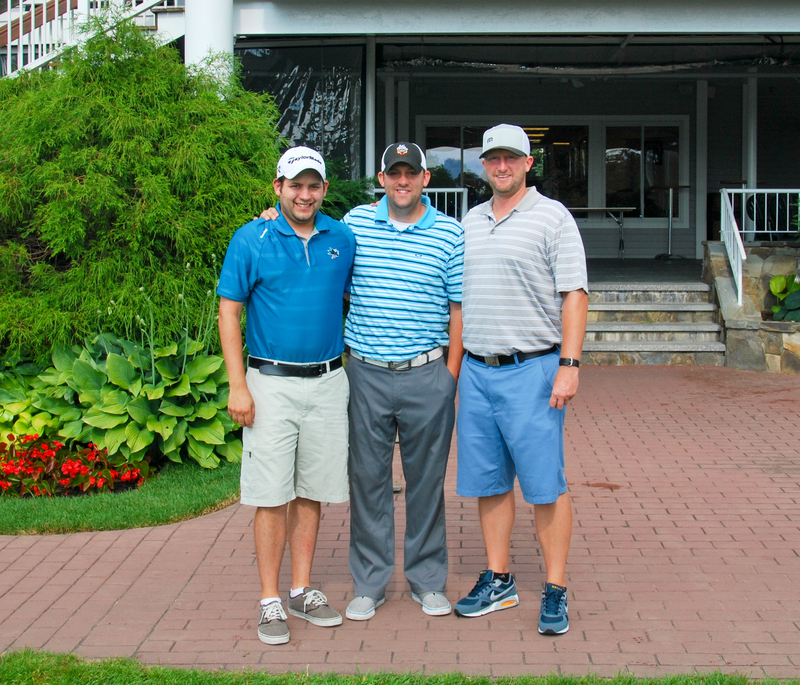 Portsmouth Country Club is a great place for golf. Given that it’s barely an hour outside of Boston, it might be the best public access course in the Boston area, given the slim pickings around there. Turning onto Country Club Lane, it’s clear this place takes pride in their work. The drive into the clubhouse might as well serve as the New England version of Magnolia Lane in Augusta. The sunlight filters through the leaves overhead, giving the road a golden glow that makes it feel like you’re driving into you’re own world away from everyone else. The entire course is surrounded by groves of trees or the gorgeous bay. The water is clear, calm and a perfect blue that stretches as far as the eye can see, winding through the inlets back out to the Atlantic Ocean. I’m sure even the winters here are lovely. There was never a Revolutionary War battle fought in New Hampshire, and I’m sure that it was because neither the Brits or Americans wanted to spoil the perfect landscape of The Granite State. Or maybe it was just too far north for any hostilities, who knows. I enjoyed every minute on this golf course, from the 1st hole through the 19th. The cool part about this golf course is that there is no out of bounds. There are miles of lateral hazards as the majority of the layout skirts the marshlands. But that also means that the driving range bordering the par-4 1st hole to the right is in play. If you feel like braving the barrage of golf balls. 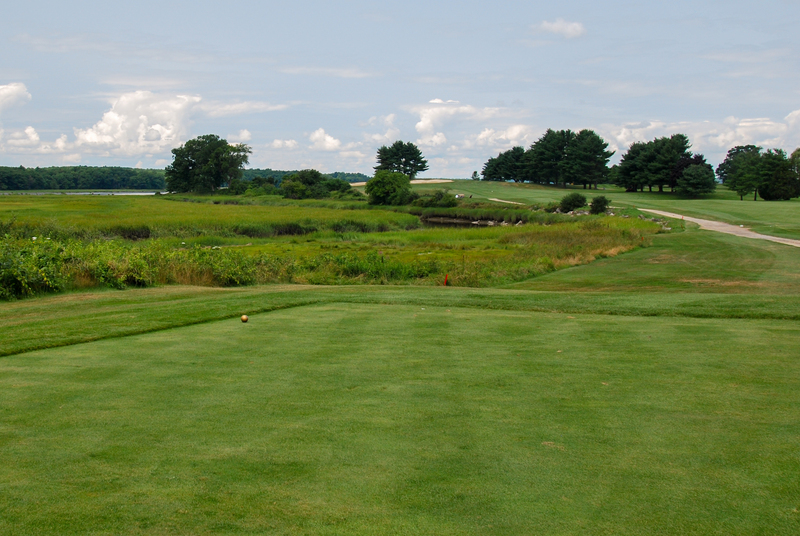 From the actual fairway, however, it is a simple starting hole at 386 yards with a slight bend to the right. The green is hidden by a small mound just in front and slopes hard off to the back. The monster 2nd, a 445-yard par 4, requires accuracy off the tee because of the forest lining the right side clipping off that angle. The left-bending 3rd looks tempting to bite off a big chunk, but the safe play is still the right side and still leaves just a short iron or wedge in. The first par 5, an uphill climb of 494 yards, is the first hole that really lines that marshland. It runs along the fairway the first half of the hole before it climbs to a green guarded by two bunkers that keep that long iron attempt to reach in two a risky choice. Get used to seeing two bunkers in front of the green here at Portsmouth. Every hole has at least one sand trap in front of the green and 14 add a second, just to make sure they have their bases covered. Maybe after building the course they had a bunch of sand left over and decided to put it to good use, who knows. The lovely 157-yard par-3 5th is a pretty straightforward iron, but there can be a breeze as you start making your way out into the seashore. The 410-yard 6th is protected by three greenside bunkers! At 500 yards, the 7th is potentially reachable with a good drive, but a tiny pond on the left makes that choice harder. The green is slight elevated but is receptive to a soft wedge. The hardest hole to par is definitely the par-3 8th. 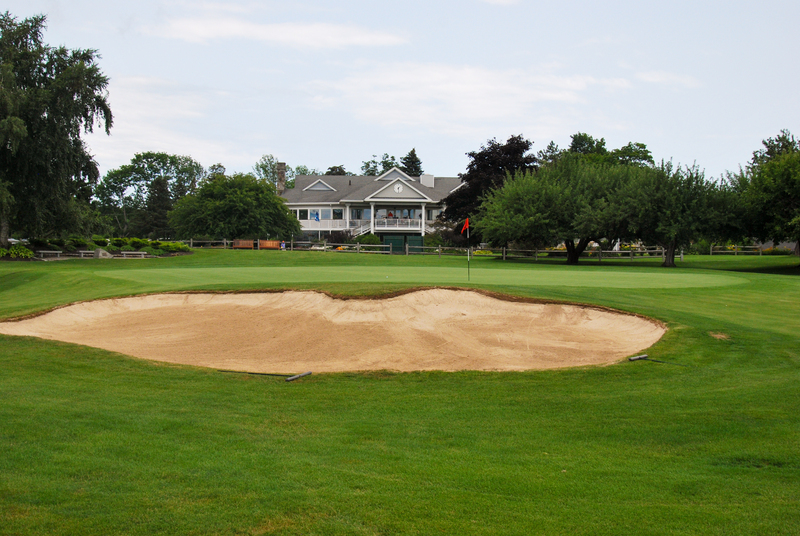 It is 219 yards, all uphill and the sand traps narrow the entrance to the green to just a few yards. Considering it’s gonna take a long club to reach and with the elevated green harder to hold, you might wanna run one onto the green, but those bunkers basically turn that play into threading the needle. So, I hope you can hold a 5 wood. The closing 9th is a short dogleg-right. The corner can be ct, which helps lessen the approach that can be difficult because of a tricky green. The back nine starts with a 418-yard par 4 that acts as a bridge to the best part of the course. The 11th thru 14th holes play along a peninsula jutting out into the bay that are as perfect as any out there. The 11th, a short par 5, plays uphill and short. A large sand trap sits about 30 yards from the green ready to swallow any attempts that try to roll on. The brutal 12th hole is a 452-yard par 4 that needs a long tee shot and a better second shot for even a sniff of the green. An easy shot that looks harder because of the high sand trap in front, the 13th plays 152 yards. The short 13th, at 329 yards, plays back to the clubhouse. It’s actually a tricky hole, with a dogleg left and a big weeping willow tree blocking the corner. It’s a steep climb to the green on the approach. The final par 3 is the 143-yard 16th which plays to a large green guarded in front by… you guessed it, two bunkers. The 17th is a straightaway par 4 of 401 yards. 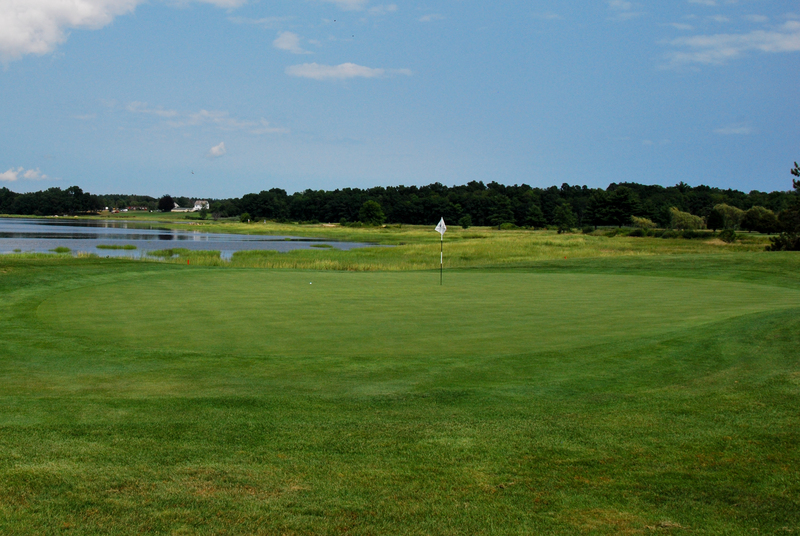 Portsmouth closes with a par 4 of 410 yards that plays to an elevated green with sand below the hole. On a humid day like this day was, it can be tougher than it looks. Layout: B; a solid golf course, and that stretch of holes along the bay is memorable (there are a couple others on the front nine that skirt the water as well). 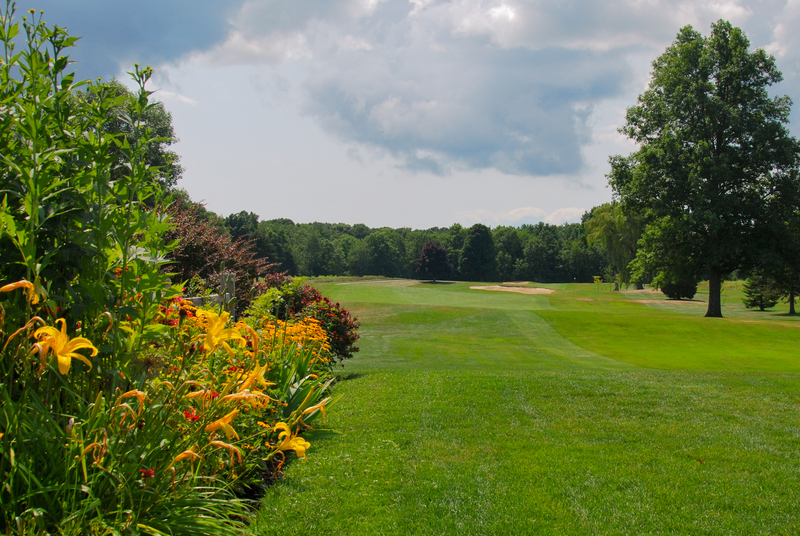 Scenery: A; I can only imagine how amazing the entire golf course looks come October when the leaves turn and that famous New England foliage shows. Value: B-; triple digits at $105 (sales tax free! God bless New Hampshire). Considering this is a private club and we ordinary golfers are mere guests, it’s a fair deal to have one of the top experiences I’ve had in 21 states.